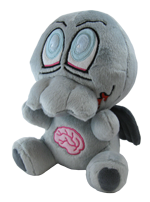 If you read my What’s New at Steve Jackson Games report, you might have seen the Plush Tentacle on that list. Even though I work for the company, there’s a lot of toys and games I don’t personally design or help create. This particular project was already designed, created, and in the manufacturing queue before I started! Sneak Peek at Zombie Chibithulhu, Munchkin Axe Cop, Munchkin Conan and more! This preview and the images were provided with permission from the publisher as part of FlamesRising.com’s continuing coverage of Steve Jackson Games Week. Today, you’ll find images of upcoming Munchkin Games including Munchkin: Axe Cop, Munchkin Zombies 2, Munchin: Conan and a few other Cthulhu-related treats. From Steve Jackson Games to our dice bags, there will be an attractive plethora of custom and jumbo die this Fall for Cthulhu Dice, Fairy Dust and Munchkin Jolly. One color in particular stood out in our minds. We regard it as watered down red, but you’ll probably look at it and go… Pink? Pink Cthulhu Dice? With SPARKLES? It’s almost as if they know we’ll lose sanity just by picking one of them up. Well, if that doesn’t cause you to go a little insane, the giant foam Cthulhu Dice (pictured above) probably will. Instead of marbles? Think Silly Bandz in the shape of Cthulhu. Oh. My. Monsters: can’t live with them, and . . . well, it seems like there’s days where you’re spending all your time killing them. Particularly when it comes to horror gaming. If you’re not out staking vampires, you’re blasting zombies or shotgunning werewolves. There are many table top RPGs that dip their toe into the horror genre with great aplomb. And when it comes to “regular people” (AKA Player Characters) taking up arms and blasting apart things that go bump in the night, three or four titles instantly come to mind. And one of those titles is GURPS–as if you didn’t know. 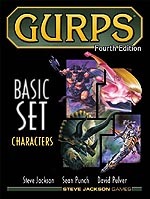 For the uninitiated, GURPS stands for “Generic Universal Role Playing System”, which is a fancy way of saying, if you can dream it up, you can play it using GURPS. First published in 1986, it came out at a time when nearly all RPG systems were tailored to a particular genre. 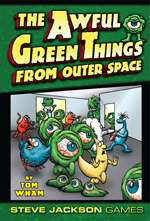 FlamesRising.com is pleased to present you with a peek inside GURPS Horror 4th Edition from its author, Kenneth Hite. For those of you familiar with his work, you might suspect Kenneth Hite is no stranger to writing about all things dark and terrifying. In this essay, Ken talks about the additions and influences he infused into the new edition. I started writing the Third Edition of GURPS Horror in very late 2000, right about the time that Final Destination, Scream 3, and Urban Legend: The Final Cut were finishing off (with one or another degree of skill and chill) the horror boom of the 1990s. No, wait, I lie. I actually started writing the Third Edition of GURPS Horror in 1998, only I called it Nightmares of Mine at the time, and I was writing it for Iron Crown Enterprises. So I began writing it during the Indian summer of clever, self-referential horror: The Faculty, Fallen, and Gods and Monsters were all part of that horror year. By the time I finished it, Iron Crown had gone bankrupt, and I had folded pretty much the entirety of the horror-gaming advice from Nightmares of Mine into GURPS Horror, Third Edition. Steve Jackson has dominated the games industry lately with a seemingly endless supply of Munchkin-related games, accessories and knick-knacks. Just to prove there’s more going on at Jackson Labs than Munchkin, Steve Jackson Games released Zombie Dice last year to great acclaim. That acclaim is well-earned: Zombie Dice is fast, fun and addictive, and it’s cheap to boot. Zombie Dice includes 13 dice, instructions, and a dice shaker/storage container in the package. The instructions are very simple: you (as the zombie) roll three dice at a time, and pick them out of the cup without looking at them. If a brain logo comes up, hooray! – you’ve successfully eaten some brains; set those aside. 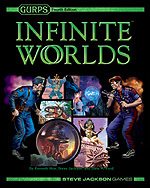 GURPS Infinite Worlds: Worlds of Horror will detail six alternate Earths where history has taken a turn for the terrifying. Designed as being light on rules and heavy on atmosphere, Worlds of Horror should prove fascinating for anyone who wonders what might have been . . . more horrific. This preview material has been taken from one of those worlds, called Taft-1. The year is 1962, and Stalin still lives. And he has worse allies than Hitler. Luckily, I have had the pleasure of meeting Kenneth Hite, albeit briefly and in passing, at a convention only a short time ago. He was engaging, intelligent, and knowledgeable about things most people find horrific with a particularly keen interest in Lovecraft. I could think of few other game designers and authors better suited to write a game of horror. 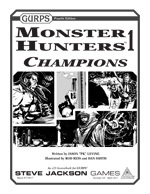 Even though I found myself quite daunted at the thought of reviewing a Steve Jackson Games product, I was not disappointed and from the first few lines my attention was transfixed while my mind whirled with the possibilities of my own fear-filled campaigns. 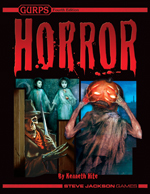 GURPS Horror, which I will simply shorten to G:H, begins with a history of the game, a small dose of the authors quite note-worthy credentials, and a short piece on what exactly ‘horror’ and horror role-playing is. After a brief explanation on why players need to remain mindful of their fears, G:H jumps into character creation. Going beyond simple numbers or hastily jotted notes, Hite actually seems to endorse players giving quite a bit of thought about their characters backgrounds.